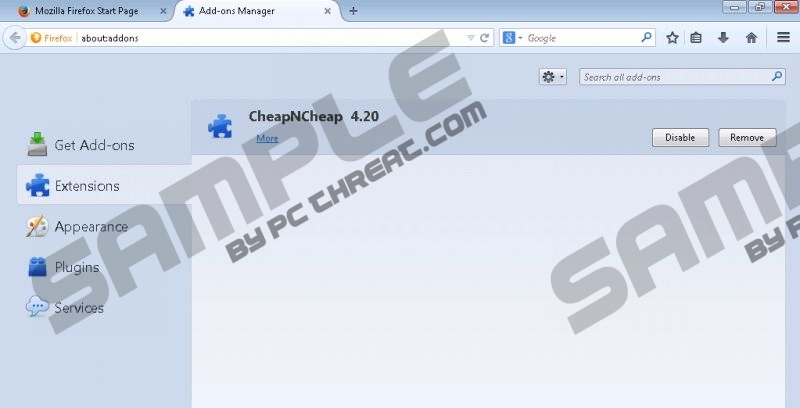 CheapNCheap is a JustPlugIt-based browser add-on that works on Internet Explorer and Mozilla Firefox. As the name of the program suggests, the CheapNCheap browser add-on is aimed at providing you with online deals that match your budget so that you can save money while browsing online. The program is distributed alongside other free programs, such as media players, system optimization programs, and other browsers add-ons. Due to the fact that a single software installer can offer you several programs, you should never blindly install any free program. Always review the information you are provided with by the installation wizard, and decline unwanted program so that you do not need to remove them afterwards. The CheapNCheap browser add-on is categorized as adware, and we recommend that you remove it from the computer. You have probably noticed that the program displays a great variety of pop-ups, web banners, and other types of advertisements, and the content of those ads depends on the intentions of third parties. The developers of the program do not monitor and review the websites advertised; moreover, they do not accept responsibility for the actions of the third parties, which is one of the reasons we encourage you to remove CheapNCheap from the computer. Any unreliable website can be advertised by CheapNCheap; for example, you may be invited to take a part in a survey or scan the computer using a questionable application. If you want to prevent spyware and malware programs, you should avoid using programs such CheapNCheap, so take action to get rid of the questionable program. CheapNCheap is very similar to SaferWeb, LuckyCoupon, Smart Ones, and many other programs based on the JustPlugIt platform. All these programs exhibit the same behavior and are categorized as adware programs. Moreover, all of them, including CheapNCheap, are capable of recording certain non-personally identifiable information. They record search terms, clicks, impressions, browsing history, browser settings, browser types, IP address, and other anonymous information that could be used for various purposes. Usually, adware programs collect information in order to understand users’ browsing patterns and interests so that new advertising-related strategies can be adopted. In order to have CheapNCheap removed immediately, we recommend using SpyHunter. This real-time security program can easily eliminate the unwanted JustPlugIt program and safeguard the system against multiple threats, including browser hijackers, adware programs, Trojan horses, ransomware infections, and many other threats. You can try using our instructions provided below, but do not forget to scan the computer afterwards. Quick & tested solution for CheapNCheap removal.